Blink-182 is letting the fans pick the set. Vote for what songs you want to hear at the certain date and it has just been announced that they are also selling limited edition merchandise. Example: a bunny?! and tour posters(only 30 per city), and I think a different t-shirt per city. Blink 182 just announced on the Grammys that they are back together! Who gets to meet Tom Delonge everyday? today i was walking in downtown chicago, and i see three men walking in front of me, the one in the middle looks familair, i get to the side of them and i say "oh my god" the man turns around and responds with "oh my god" its tom delonge! he's in town for the angels & airwaves and weezer show tomorrow at the allstate arena in rosemont il. we talked about how i first saw him in 2002 on the pop disaster tour with green day and he laughed saying that was along time ago and that those were the days. i gave him directions to where he needed to go, he was looking for a store. and we went on our way! Hey, I've got five Blink shirts that I can't wear anymore. They're all XLs. I was wanting to try to sell them off, preferably to another fan instead of some secondhand shop where they will go even longer without being enjoyed. If you want all of 'em, that'd be nice, but I will sell them separately, obviously. Throw out an offer for the one and/or all of them. Yeah, YOU set the price! If you want one shirt, please allow $5 for priority shipping within the US. If you want more, I will go and get you a shipping quote for some other method if it will be cheaper. If you want all of them, please allow $9.80 for Priority Mail Flat Rate Shipping. PLease send any and all offers to HEYWOODHEAD@YAHOO.COM. Or PM me through the thing LJ has. If you like what you see here, please check out my selling journal at alive20004sale. Tons of merch from similar bands for sale..please check it out!! Must Have for Tom Delonge Fans!!! Tom Delonge Quantas Adio Shoes RARE! auction ends in an hour! i've had this patch for years..and never used it. i hope someone will find interest in it. New purses, jewelry, random items, band merch, clothes & other items over at takingbacksammi EVERYTHING MUST GO...like now. ALL OFFERS CONSIDERED. I've got some very expensive school books to pay for! & also a few pins not listed yet..MOTION CITY SOUNDTRACK & Star Wars! I am going to be graduating early this semster, so I am need of money so I can move. This is a few years old, and I won it during a call in Charity at a local radio station so it's in good condition never hung up as I don't have any need for it. The frame is real glass, no dents or anything of the sort. Extra photo under cut along with price details. Also a few other items I am selling as well. Please note all shipping if free unless outside of the United States. they have songs from every record on there! 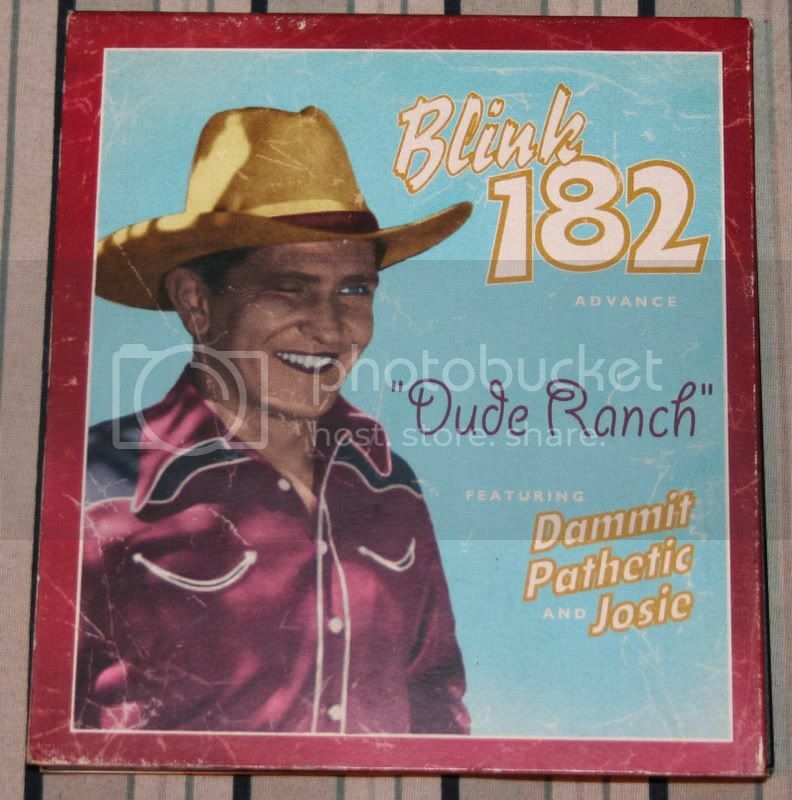 Rare Dude Ranch Promo for sell. I have to departed with my Dude Ranch Promo. It's Out of Print and really hard to find. If anyone's interested it, it's listed here. help us do that by click the banner and voting 919 !!! !then tell all your friends to the same!! !